Having shown good pace during one of his first competitive visits to Spa-Francorchamps last time out, Nathan Freke was hoping he could keep his championship aspirations firmly on course coming to Snetterton for the penultimate weekend of the year. The second time this season to feature two 60-minute races, Freke knew that the pace would be hot right from the off amongst his rivals. 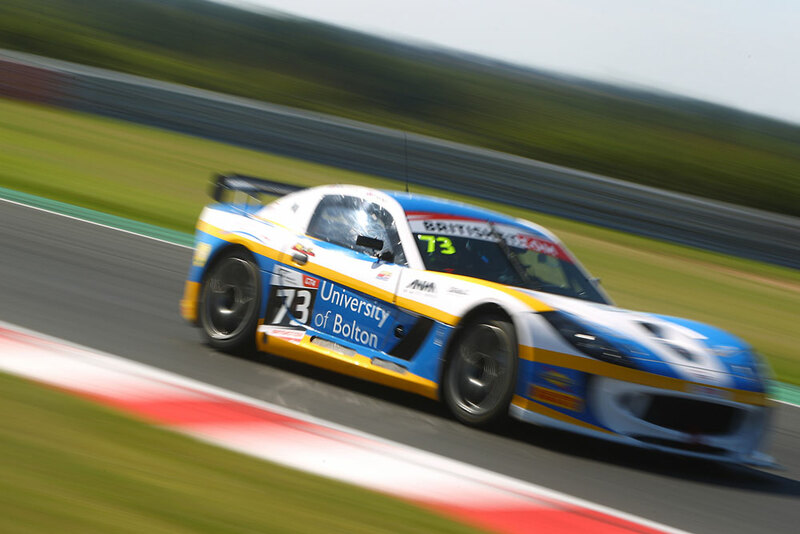 Getting their weekend off to a mixed start on Saturday morning during free practice, the University of Bolton and Westons duo managed to keep themselves inside the top 10. A slight off for Anna at the end of Free Practice One gave her part-University Student staffed team of mechanics some early repair work to get the crew back out for the second session. Working hard to find a suitable balance on their car for qualifying, Anna was out on track first on Saturday afternoon to place her Ginetta tenth on the grid for Sunday’s first of two single hour races. Handing the car over to Freke for the second part of the session, he managed to secure ninth on the grid for race two, but crucially, both drivers felt their lack of pace was due to a strange braking issue that they hadn’t been able to solve during the morning’s running. The warm and sunny conditions carried over from Saturday into Sunday, providing an ideal scene for the day’s two races. As the lights went out on race one, Anna made a superb start to the race, avoiding most of the bumping and pushing in what she described as a ‘Touring Car start’ at the first corner. At the end of the second lap she had already climbed one place to ninth and set about getting into a consistent groove. Despite slipping behind Aaron Mason’s Ginetta on lap six, Anna remained in touch with the main pack as the pitstop window opened at the 25 minute mark. Diving into the pits, a busy pitlane prevented them from capitalising on a smooth pitstop and dropped them slightly down the order as Nathan took to the track for his stint. After just on lap on track, he was now lighting up the timing screens, instantly setting one of the fastest GT4 lap times as he hunted down Bradley Ellis for ninth. Closing the gap by almost one second in one lap alone, Nathan shot past the Ellis Ginetta on lap 25 to move into ninth. There he would remain after 60 minutes of racing with both drivers complimenting the overnight work by the team to resolve their braking woes. This time it was Nathan’s turn to start the race for the second and final race of the weekend. Hoping he could propel the University of Bolton and Westons Ginetta quickly up the order during his stint, Freke initially got a strong start into the first corner. However a fraught opening lap saw the #73 Ginetta pick up some damage which affected the cars performance and handling, with Nathan clearly struggling to match his pace from earlier in the weekend. Pitting the car just before the pitstop window closed, Anna climbed on board aiming to hustle the car home and secure as many championship points as possible. Given the now severe handling issues from the earlier contact, Anna put together a very good stint to finish the race 13th in class. Donington Park, Derby, UK – Saturday 10th & Sunday 11th September 2016.